The Teej festival celebrates the reunion of Lord Shiva and Goddess Parvathi after their prolonged separation of almost 100 years. Teej festival is a special day for married women and is also known as the monsoon festival. Married woman believe that on this day seeking the blessings of Parvathi could bring continued bliss into their marital life. Teej usually takes place in July or August. It is mostly celebrated in the state of Rajasthan and it is known that to experience the full fledge of Teej festival, you have to be in Jaipur. The celebrations here are grand and filled with lots of singing, swinging, dance and also a splendid feast for your taste buds. 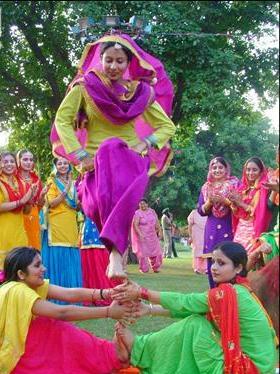 Teej festival is celebrated mostly by woman with great bash and boom. On this day women dress up in their fine clothes and jewelry to worship Goddess Parvati. Goddess Parvati is also known to them as Teej Matha. They adorn their hands with henna and sing along the well known Teej festival songs to celebrate the day. A main highlight of the festival is well-decorated swings that are fixed to branches of a large tree like a banyan tree and women take turns to swing on them. 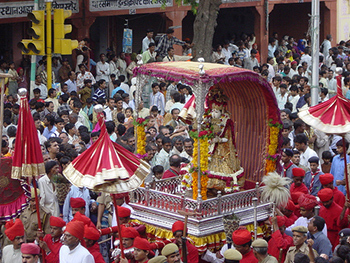 A royal procession of the Teej Matha that moves all around Jaipur is organized specially on the day. This royal procession is equipped with the grandest palanquins, well decorated bullock carts, camels, elephant and horses as well as adorned dancers. Girls who are engaged for marriage get gifts like henna, bangles, well-embroidered dresses and sweets on this special occasion. Married daughters get gifts like clothes and sweets from their parents once the celebrations are over. There are various traditional Teej recipes relished by people as they celebrate the arrival of rainy season. Some the traditional Teej dishes are Besan burfi, khoya burfi, Mango raitta and almost all kinds of Indian sweets. Teej festival well known as a colorful celebration could be made brighter by sending online invitations through our free online invitation maker at Yoovite to bring all your women folks together and make this Teej Celebration the most memorable one.